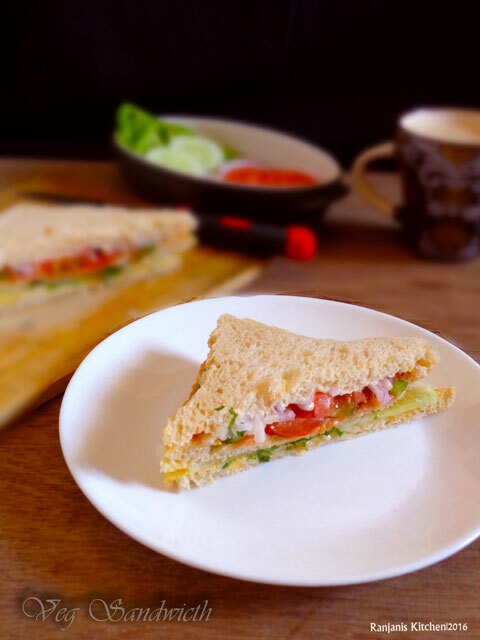 Vegetable sandwich recipe – healthy start of breakfast with a cup of coffee. Bread recipes are easy and time efficient to make for breakfast. I already posted cheese bread toast. You can check it for quick breakfast idea. No oil and no cook recipes are always healthy . I didn’t toast with ghee but it was good to eat as normal. You might like my other bread recipes also Aloo Paneer rolls, home made bread crumbs. 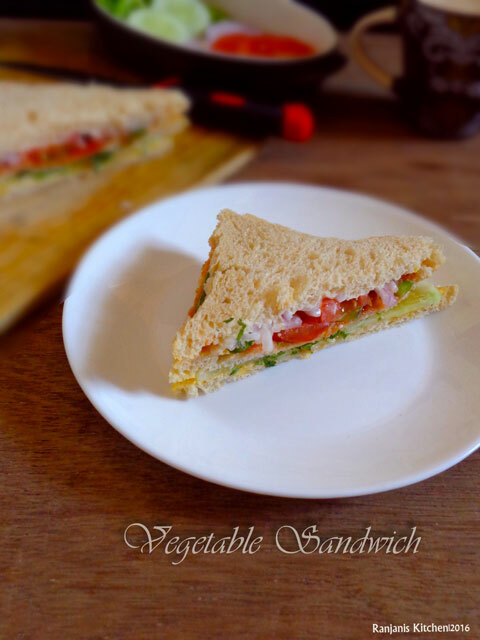 Check out how to make vegetable sandwich recipe with stepwise pictures. Take 3 bread slices, trim the sides and place it in a plate. Applt butter on bread, tomato ketchup on another bread and mayonnaise on third bread. 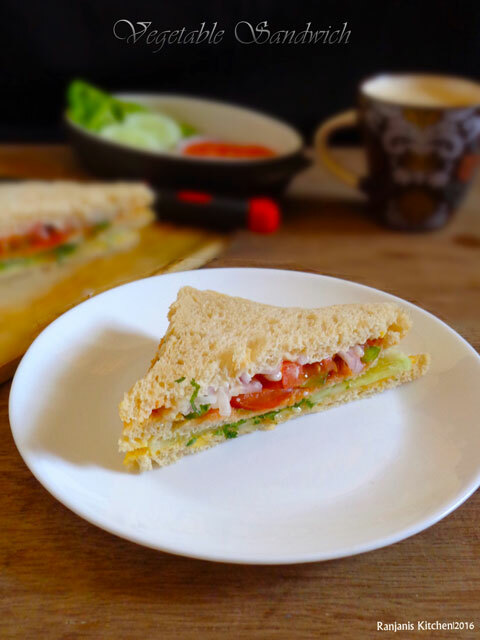 Now place 4 slices of cucumber on one bread and sprinkle some coriander leaves. In another bread, place sliced capsicum, onion and tomatoes one by one. Now place the second bread over the first one. Cover the second one with third bread which is mayonnaise applied. 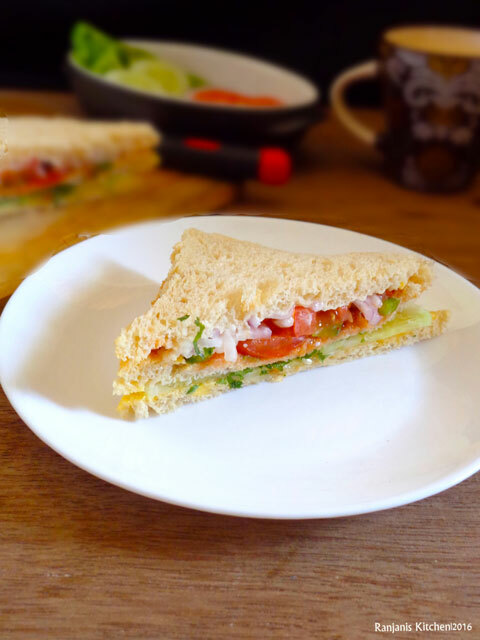 Give a gentle press and cut in diagonal cross to get a triangle shaped sandwich. I used wheat bread with toasting. But you can use any bread and toast with ghee. We can cheese cream also instead of mayonnaise. Salted butter tastes well for sandwich. You can add cabbage , carrot also to this sandwich. Go back to recipe index to see full collection of recipes.